FineLIFT includes all the tools you need to perform the necessary calculations and generate automatically the entire set of the elevator drawings along with the bill of materials, technical specifications and other documentation. In Fine LIFT you can create your project by just defining the basic parameters of the elevator and selecting the appropriate equipment from the program libraries. FineLIFT combines a state-of-the-art BIM technology and an AutoCAD-like look and feel to help you to draw your project faster and easier. Fine LIFT includes all the tools you need to perform the necessary calculations and thereafter to generate automatically the entire set of the elevator drawings with all the construction details. Drawing the building in 3D with BIM objects is not required to proceed to the elevator design but you can also do it in a few clicks. Calculation and design are independent modules and particularly for Fine LIFT you always start from the calculation module given that the set of the detailed drawings is automatically generated directly from the calculation results. 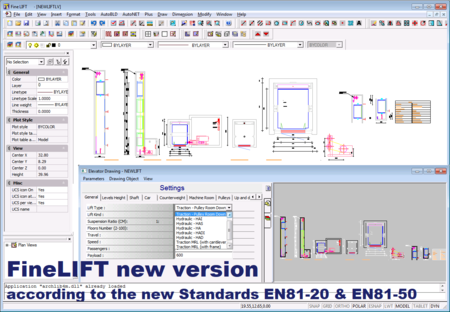 Unlike other BIM Elevator Software, Fine LIFT is producing files directly in DWG and includes features to convert the sophisticated BIM objects that can't be seen in CAD software into simple vectors that can be further edited in AutoCAD®. Sharing 2D or 3D files with other professionals is therefore much easier. This Elevator Software includes all the features of 4MCAD , our alternative to AutoCAD®. You get 2 software in one, you can keep using CAD to edit some DWG drawings while using our BIM technology to increase your productivity when working on most of your projects. At least you can feel safe and migrate to BIM at your own pace. Unlike in other BIM software, Fine LIFT's modern BIM technology does not come at the expense of speed, it is just the opposite : you just need to insert the project data and the software will do the rest. Fine LIFT includes extensive libraries of elements (guide rails, wire ropes, pulleys, motors, pistons, pumps, supply pipes etc) including all their technical characteristics, parametrically defined. These libraries can also be extended by the user who can add more components. After performing the calculations you will update the drawings from the calculation module and then get into the project drawings to define the specific details you would like to display about each drawing (i.e. type of doors, topology of the engine room etc). Fine LIFT will also help you to create automatically tables and legends with respect to the technical drawings automatically produced by the program. 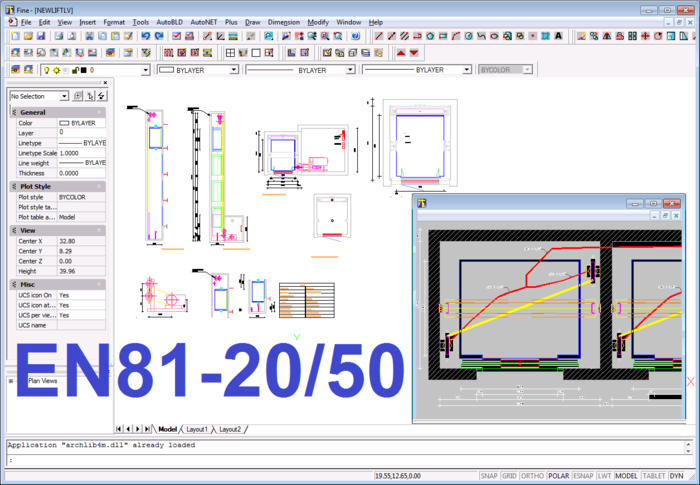 FineLIFT's Calculation module is closely interacting with the elevator technical drawings. Calculations are performed following the latest Standards EN81-20 and EN81-50, as well as the CIBSE 2010 Traffic Analysis. 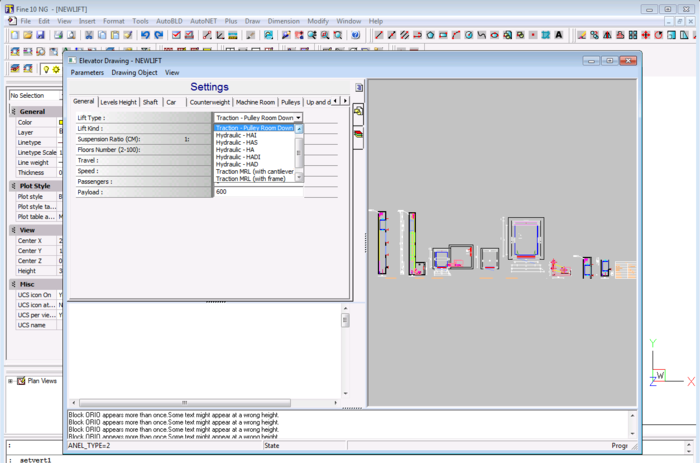 The calculations Component of Fine LIFT generates automatically the entire set of the drawings required to describe the installation in a construction level detail. Calculations are based on the EN81-20/50 European standards which are widely accepted all over the globe. Fine LIFT calculates all the necessary equipment (i.e. type of guide rails, car attributes and dimensions, pull diameters, motor power etc), as well as the bill of the materials, technical descriptions/specifications and other results, in just a few clicks. After proceeding to the calculations our MEP Software will let you generate all the technical drawings and reports you need. Our MEP Software will generate for you the entire set of elevator drawings in DWG that you can further modify and/or share. Fine LIFT will generate a document with the calculation results and the bill of materials describing the quantities of each of the elements required to assemble the elevator installation. The template of this document can be customized and you can chose which results you want to display. The elevator installation will be updated with the results of calculation, along with labels to define the details of each component. As a result you will be able to generate all the project drawings in DWG along with all the construction details. Fine LIFT's advanced BIM technology will increase your productivity. Using our smart 3D modelers and libraries of 3D BIM objects for elevator design you will be able to draw the building much faster and easier. The close interaction of our Calculation module with the BIM model will help you to generate the project drawings directly from the project data. Fine LIFT will simply read the project data in order to proceed to the necessary calculations and finally to generate and update the drawings with all the results. The BIM information can also be extracted to create a Bill of Materials showing the quantities and details of the various elements you created in the specific elevator installation. You can calculate the cost and get a detailed description of the elements you need.